This shelf has a quality feel that looks very nice in our half bath. Lovely finish and thick tempered glass that came fully assembled. Very sturdy! Add space and organization to your bathroom with this simple, contemporary style glass shelf. 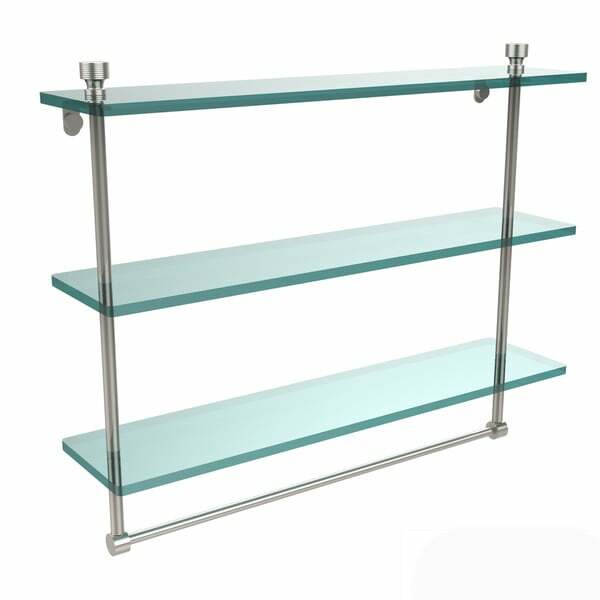 Featuring tempered, beveled-edged glass and solid brass hardware this shelf is crafted for durability, strength and style. Integrated towel bar provides space for your favorite decorative towels for for everyday use. One of the many coordinating accessories in the allied brass collection of products, this subtle glass shelf is the perfect complement to your bathroom decor. High Quality and very easy to install. Polished Brass bars are beautiful and will go with both modern and old style decors. We chose these to go with our Nautical themed decor. Our home was built in 1927, and our bathrooms have beautiful hand painted tiles on the walls. We bought this beautiful shelf to match the bronze doors on the shower and cover holes previous owners drilled into the tiles. Many thanks! Easy to install, great buy. "What are the measurements between the shelves? Thanks!"